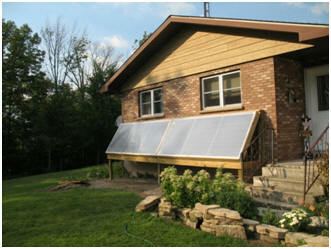 Rob's new solar heating system provides both solar space and water heating. The system is based on the $1K drain back design, but incorporates a number of very interesting design variations that may be helpful if you are doing a system. Rob's finished system with the two hizer design collectors. Side view of the collectors. Rob's collectors are the first ones I know of to use the hizer design in a drain back system. In order to insure that the collector water drains back to the storage tank (for freeze protection), all of the hizer runs are sloped slightly downward toward the supply manifold. One of the collectors showing the hizer arrangement. While Rob used two 10 ft wide hizer collectors, it would also be feasible to build a single 20 ft wide hizer collector. 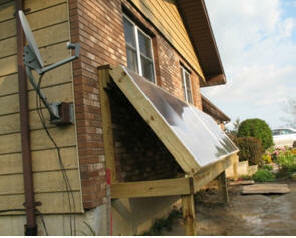 For large solar space heating applications that might now use 5 or 6 or more side by side 4 ft wide by 8 or 10 ft wide collectors that must all be installed separately and plumbed together, the hizer design offers the possibility to build one large collector in place with with 25 or more ft long horizontal hizers instead of many many vertical risers. It could be a real plus for wide, large site built collectors. In addition to the saving in time and material, it is believed that the hizer design will be easier to get even collector filling and flow. 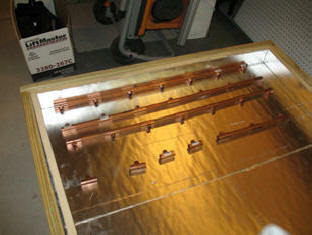 This shows the vertical manifolds being laid out. Rob did a very careful job of working out the structural and plumbing details for the system, and much can be learned by just going through the detailed construction pictures and seeing how Rob handled the various construction details. For space heating distribution to the house, Rob will be using a water to air heat ex changer mounted in the furnace ducting. 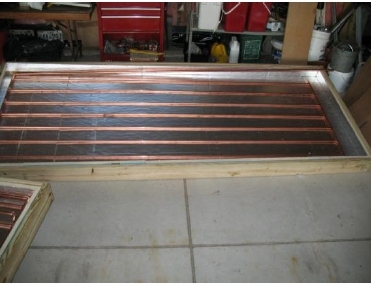 He plans to make some use of this same heat exchanger for summer cooling using well water. Thanks very much to Rob for taking the time to carefully document the system! Wow ! wonderful information what a great web content, I have added your site to my bookmarks. and I will keep an eye on it, Thanks for sharing.